Stock picture of a cat mask. Not the one used in the incident. A furious ex-girlfriend wore a cat mask and fired a toy gun into the street during an angry confrontation with her former boyfriend. Alliyah Jackson, who witnesses said was wearing pyjamas as well as the feline-themed disguise, shot pellets from the child's toy from the window of a Toyota Yaris being driven by a male friend. Some by-standers were hit by the harmless, red plastic, missiles but nobody was hurt. 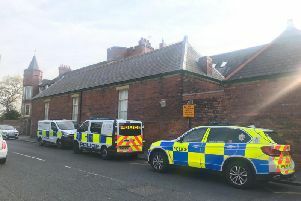 Newcastle Crown Court heard the 19-year-old had had an angry telephone conversation with her former partner shortly before the stand-off in Walker, Newcastle, last March, which happened near his home. The former couple had arranged to meet in the street but Jackson turned up firing toy ammunition from the motor. Prosecutor Paul Rowland told the court: "Miss Jackson was wearing what was described as a cat mask. It would seem she was in possession of what would appear to be a gun, a handgun. "It became apparent that pellets, plastic pellets were discharged from the weapon, which was in fact a child's toy. "Some of the people present were hit by the plastic pellets. "Fortunately no injury was caused and no marks were left by the pellets, which fell to the floor." Jackson, of Linnetsfield, Walkergate, Newcastle, was initially accused of threatening with an offensive weapon and possessing an imitation firearm with intent to cause fear of violence. The more serious charges were dropped after she pleaded guilty to affray. Jackson also admitted an unrelated charge of common assault in relation to a street confrontation the previous day with a love-rival who had been in an earlier relationship with the same ex boyfriend. Jackson's pal Brandon Tate, 20, of Belvedere Court, Heaton, Newcastle, who drove her to the toy gun stand-off, admitted affray. Judge Tim Gittins sentenced them both to 12 month community orders with rehabilitation requirements. The judge told them: "Fortunately, the incident was less serious than it might have been. "Anyone brandishing that sort of imitation firearm about puts themselves at risk, not only of serious action being taken by the courts but by the armed response team, if they were called to deal with with you. "You were, in reality, putting yourselves in as much danger as anyone else." Paul Caulfield, defending, said Jackson's relationship had broken down in "acrimonious" circumstances but there has been no further trouble since. Mr Caulfield said it would have been "obvious" that the toy gun was not a real weapon. Mr Caulfield added: "It is the sort of thing my three-year-old grandchild would use in my back garden, frankly."